The Metropoli Bisanzio Foundation is registered in Saint-Petersburg, Russia. The foundation was created in order to present the rich culture of the Byzantine Empire to a wider audience. The Byzantine Empire is a common root for Russian and European cultures, and consequently for Italian Culture. The mission of the foundation is to promote the culture of the Byzantine Empire through modern channels of communication, therefore giving access to the cultural heritage of Byzantium. The board of directors of the foundation consists of Dr. Igor Danilov, Dr. Maksim Frolov, and Dr. Svetlana Savinova. Critics and historians of Oxford, Rome, Moscow and Saint-Petersburg Universities have participated in the creation of the album “Cities - Heirs of Byzantium 2013”. The album “Cities - Heirs of Byzantium 2013”, contains photographs of places and antique monuments of twenty-four Russian and Italian cities, and was first unveiled at the MITT-2013 tourist show in Moscow. The album was also presented in Nizhny Novgorod, Suzdal, Tver, Novgorod, Rostov Velikiy, and other Russian and Italian cities. The foundation realizes a series of different initiatives aimed at promoting the study of Byzantine culture. 1. The Metropoli Award - the award’s goals are to support Byzantine Studies as an academic discipline, to present to the public the results of these studies and to enhance the interest of the public in the Byzantine Empire. The award shall be granted to the best work on the history, culture, literature and art of the Byzantine Empire. 2. The Metropoli Study Bursary – every year, the Metropoli Bisanzio Foundation grants one study bursary for the postgraduate study of the history, culture, art and literature of the Byzantine Empire and its relations with neighboring countries. Another fundamental initiative of the Metropoli Foundation is the creation of the Cities - Heirs of Byzantine Association (ACEB), which unites the cities that have common roots connected with the story and culture of the Byzantine Empire. The main mission of the Cities - Heirs of Byzantium Association is, based on the study of Byzantine traditions and culture, to present the role and significance of Byzantine culture in Europe and its contribution to the development of word civilization. The project’s ambition is to demonstrate and promote the cultural patrimony and rich heritage of the Byzantine cities in Russia and Italy, as well as in other countries, which have immense potential in attracting tourists and consequently attracting investment. Already, twenty-nine Russian and Italian cities have applied for Cities - Heirs of Byzantium Assosiation membership. The first assembly of the ACEB Association is scheduled on 27th February 2014. 1. Development of direct cultural links between the participant cities of the association, and the corresponding organization of cross-participation in each other’s cultural events. 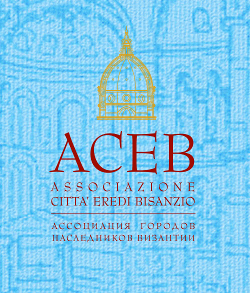 The cities’ festivals and cultural events will be included in the united cultural events program of the ACEB association, which will be promoted through the mass media, not only within the cities’ administrations, but also to a wider audience in Italy and Russia. The above mentioned initiatives will assist the development of bilateral tourist exchanges, and the organization and promotion of tourist and cultural initiatives necessary to attract tourists and to develop the cities economically. 4. Promotion of the cities’ cultural and historical heritage through cross-cultural projects such as cultural monuments, and photographic exhibitions in Russia and Italy. 5. Lobbying the interests and international projects of the Russian cities, and businesses in these cities in Italy and of the Italian cities in Russia. A fruitful Russian-Italian dialogue can become the first step towards to a historical understanding of Byzantine heritage, and the natural respect of the equitable braches of European civilization.